F-18 cockpit camera captures stunning moment a lightning bolt strikes the aircraft canopy. A cockpit camera in an F-18 fighter jet captured the shocking moment a lightning bolt struck the cockpit canopy, startling the pilot. The plane was being flown by a Kuwaiti fighter pilot in stormy conditions. Kuwait purchased a number of F-18s from the US two years ago. In the video, which went viral, a crack can be seen in the glass following the lightning strike. The crack was deep, but not wide, and the canopy remained intact. Aviation experts say that lightning strikes on aircraft are far from uncommon, and it is believed that every plane that is used regularly is struck by lightning at least once a year. 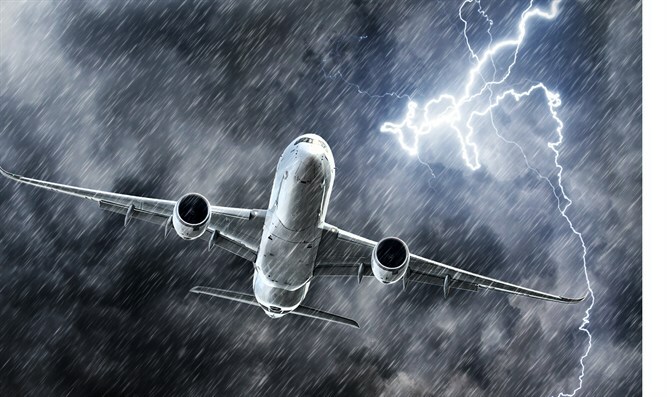 Modern planes are designed to be protected from lightning and to ensure that no gaps exist in the path the electricity travels along the aircraft's aluminum surface. Safety features are also built into the planes' internal electrical systems. The last plane crash attributed lightning in the US occurred in 1967.